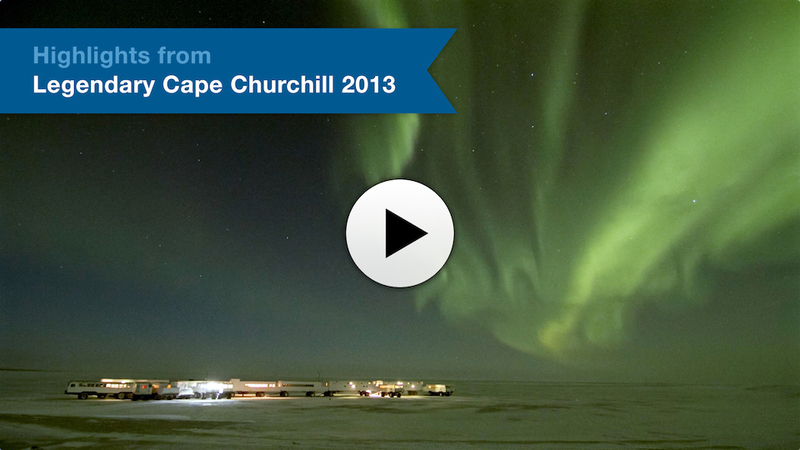 I have just returned from taking part in the Legendary Cape Churchill Adventure. Each year just 40 guests have the opportunity to take part in this extraordinary polar bear adventure offered by Frontiers North. It is the last trip of the year and it allows guests to take part in a true arctic expedition. Situated in Wapusk National Park, Cape Churchill is where polar bear adventuring in northern Manitoba all began just 30 years ago; Frontiers North is the only company in the world with access to host guests in this iconic destination. To get to Cape Churchill we travel over the frozen tidal flats of Hudson Bay taking the Tundra Buggy Lodge with us from Polar Bear Point in the Churchill Wildlife Management Area. It's a challenging journey but our destination is well worth the effort it takes to get there. With a landscape that is both breathtaking and harsh, Cape Churchill truly encapsulates the realm of the polar bear. The move to Cape Churchill is an incredible test of both man and machine. Limits are pushed as we endure the elements and the terrain. At points I find myself wondering why on earth are we doing this to ourselves. And then I find myself thinking how truly incredible it is to be part of something like this. To see this massive migration of man and machine mirroring the polar bear migration in nature is what we are here for and both are absolutely astounding. On some level this expedition is perhaps the best way for us to understand what these animals endure, first waiting for the ice to freeze and then as they venture out to hunt. We too must wait for the ice to freeze on the tidal flats of Hudson Bay in order to travel to Cape Churchill with the Tundra Buggy Lodge. Just inside Wapusk National Park the expedition earned its moniker when near the end of the convoy line of Buggies and lodge units the Buggy towing Hearne (one of the accommodation units) hit a soft spot in the ice and got stuck. For nearly three hours four Buggies and a service vehicle tried options to get Hearne out so that we can continue our journey. It is in these moments that the true commitment and skill of the team I work with is put to the test. The demonstration of teamwork is inspiring and undoubtedly necessary in these extreme conditions. Moments after Hearne is finally pulled out I hear a comment come over the radio that sums up our last few hours: ‘And that's why they call it an expedition folks’. The move to Cape took nearly 12 hours and as a staff person the work doesn’t end when the guests go to bed, there is prep work for the next day that needs to be done so on my first night at Cape I rest my head on my pillow for just two short hours. Knowing I have just eight days to take in all that Cape Churchill has to offer I want to savor every moment. So I get up that first morning and tell my tired self that I can sleep when I get home. Today is my first chance to venture out to the point of Cape Churchill on a Tundra Buggy and I’m not about to miss it. I couldn't have asked for a better day to stand out on the point that this expedition is named for. The sun is creating a sparkling blanket of snow against the ombré blue sky. Of course I took a moment to take a selfie before tucking my camera away to simply enjoy this hauntingly beautiful corner of the world. Confession: I'm not really a fan of the cold. But I am an absolute addict when it comes to appreciating landscapes and beautiful vistas and the tundra and coastal scenery here is worth enduring the biting cold 10 times over. Peaceful and serene this is the perfect escape from the mountain of emails and phone messages and deadlines that monopolize my day when I am in civilization. So while I am not a fan of the cold venturing into this landscape via a heated Tundra Buggy where I can simply sit and take it all in and stay warm through it all is pretty much ideal for me. Days into the trip I am in absolute awe of the images that so many of the guests are capturing. I wish I had half their skill and patience to snap thousands (yes thousands) of images all in search of that one perfect shot. I am thrilled to meet Glynis, who like me would rather sit back and just take it all in and snap the occasional picture with our rather simple point and shoot cameras. Each day this place gives you something that makes you appreciate just how spectacular nature is. Yesterday it was waking up in my bunk and looking out my window to find a huge polar bear staring back at me. Today it was the power of a whiteout snowstorm giving way to the soft ballet of huge fluffy white snow blanketing everything around us. A few nights ago the northern lights put on the most spectacular light show and the stars, oh the stars, make the canvas of the night sky come to life like I am surrounded by millions of lightning bugs. It is breathtaking! Tonight laying in my bunk and watching the snowflakes blow by I see something out of the corner of my eye - a pair of arctic fox are frolicking and they are such a joy to watch. All too soon it will be time to say goodbye to this incredible place and its beautiful landscape and wildlife. As though on queue while we packed up the Lodge and made our final preparations to leave Cape. A mom and two coys (Cub of the Year) strolled up along the esker. It was a perfect send off and a moment that we could all savour as our own. There is perhaps nothing more beautiful than the sight of a mom and cubs. What a fitting way to end this journey. Written by Frontiers North's Communications & Marketing Manager, Tricia Schers.